If you are a member of the PNW gardening community, the name Bee Smith brings to mind two things: That particular shade of blue she loved, and her amazing Blue garden. When Bee died this summer we lost a beautiful, amazing gardener, artist, and friend. “Have you seen Bee’s garden? It’s amazing !” This was my first introduction to Bee. I was a new Master Gardener, getting to know the lay of the land. I had recently raised my hand at the request of Rodger for someone to take over the duties of Chapter Photographer. It was Open Garden season and I was going to dutifully take my camera and get some snapshots for the chapter. Her garden was my unforgettable introduction to some of the most picturesque and personal gardens in this gardening world I was just beginning to explore. You could use a lot of adjectives to describe her garden, beginning with amazing. But after seeing, feeling and touching the garden, you walk away with a quiet regard for the woman, and her vision. Some things that struck me about the garden and gardener who was also an artist; this was a complete, but ever evolving body of work that she shared with anyone who would ask. The care given, and the scope of the grounds, were impressive of course. But even more so I was impressed by knowing that the lady of 80 plus years was able to tend her garden daily, even embark on new ideas / projects that would leave a 30 something exhausted. And I also saw the little girl in the lady. Her playfulness, her regard for imagination, her inclusion of whimsy in her palette. I have recently reviewed those photos I took in 2010, and will follow today’s post with some of those images to help complete the story being told. I suppose this is the place where a writer “should” put in more details, like a bio, about Bee. The truth is, I don’t believe that she was someone that you can limit to words in print. I didn’t know her that well, we only spoke a few times. But then … I did know her, thru her garden, and thru her friends and the loving stories told about her. And that is how I would like you to meet her, if you never had the chance, or to remember her, if you were so privileged. Her close friend Meredith met me at her garden last week, so I could take these photos for her family, and to share with you. I think we were both struck by the appearance of a usually tidy garden, missing her loving gardeners. Since it is so late in the season, there is not much in the way of flowers blooming now, and the grasses are ripe and golden. But the soul of the garden remains. The color blue, the artwork and the amazing collection of trees and perennials. As I walked around alone after Meredith left me, I could feel Bee’s presence in the changing light. The garden colors evolved as the sun moved across the sky to kiss the plants, the carefully placed art and Her collection of Blue bottles. please join me in my walk though her garden …. click first on this photo, then on Permalink next to the Like button for the individual photo pages to read the descriptions. 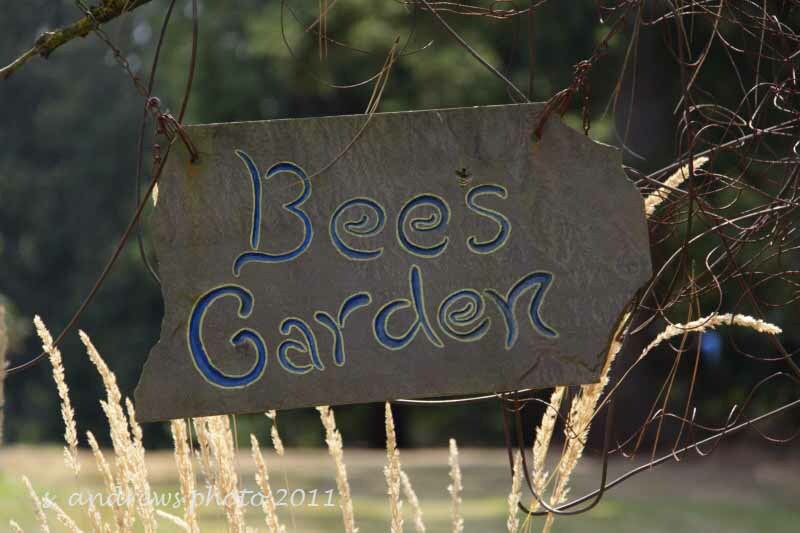 This entry was posted in in the garden, out and about and tagged Bee Smith, Bee's garden, Blue, blue bottles, Bue, Clackamas County Master Gardeners, echinops, garden, garden art, garden tour, gardener, Hibiscus, Master Gardener, plants, rose of sharon.